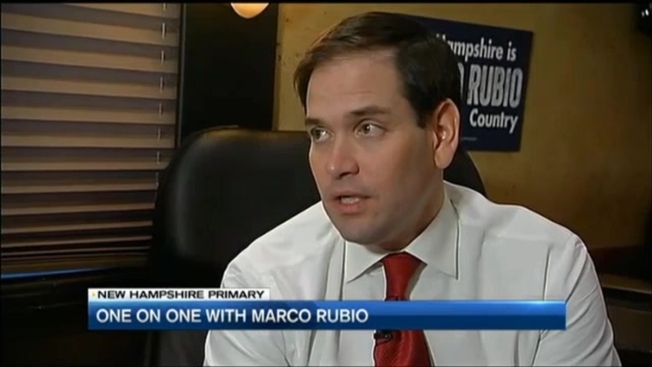 Rubio Looks to Rise in N.H.
Marco Rubio's stock is on the rise in New Hampshire after coming in third in the Iowa caucuses just one point behind Donald Trump. Having beaten the expectations game, Rubio now finds himself the key target of attack by his fellow Republicans. Chris Christie is calling him the "boy in the bubble" who sticks closely to his stump speech and runs a tightly controlled campaign. "I think, obviously, Chris had a bad showing in Iowa and he's feeling the pressure," Rubio resonded. "When people run against you for president and they're not doing well, they're going to try to attack whoever they think is doing well and that's fine. That's not the kind of campaign I'm running." Rubio is one of four Republicans considered a choice of the establishment. But Rubio does not consider himself part of the establishment. In fact, he says the establishment has spent millions trying to bring him down. "I think the conservative movement is increasingly becoming the dominant player in the Republican party," he said. Rubio says he is more focused on beating Hillary Clinton or Bernie Sanders and that he is the only candidate who can unify the Republican Party.